Le Rayon U takes place on a pseudo-Earth divided between the enemy states of Norlandia and Austradia. In peaceful Norlandia, Professor Marduk and his assistant, the beautiful Sylvia Hollis, have devised the ultimate weapon, the powerful "U Ray", but they need the mineral uradium to power it. With the help of famed explorer Lord Calder and his faithful Adji, Marduk embarks on an expedition through the savage lands of Norlandia to find it. 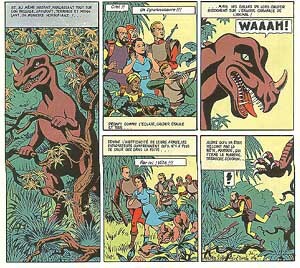 Their journey is imperiled by dinosaurs, giant snakes and tigers, a tribe of man-apes and the evil schemes of Austradian spy Dagon. They eventually find the uradium in the volcanic island of Urakowa, inhabited by an Aztec-like race. 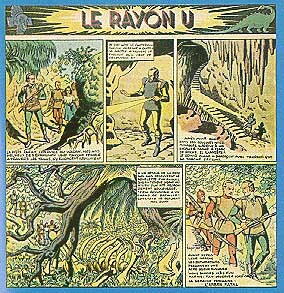 The first version of Le Rayon U featured captions, but no dialogues (as was often the case in comics of that period), and the coloring was muted in order to accommodate the newsprint medium. It was also formatted in what is called the "Italian" format, i.e. : horizontal rather than vertical. Le Rayon U was first reprinted in black & white serial form in "Phenix" Nos. 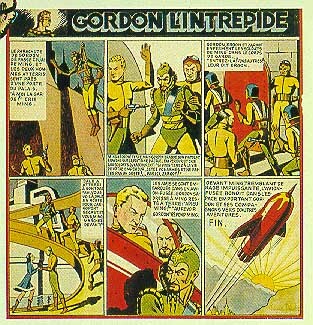 5-7 in 1966, and was then collected in the graphic novel format (including the Flash Gordon page) by Publisher RTP in 1967. 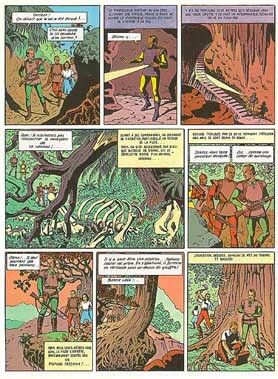 In 1974, Jacobs reformatted Le Rayon U to fit the traditional French graphic novel format, recolored it, and replaced some of the captions with dialogue. This new version was serialized in "Tintin" in 1974, and was then collected as a graphic novel by Lombard-Dargaud the same year. In 1991, a new edition was published by Editions Blake & Mortimer. 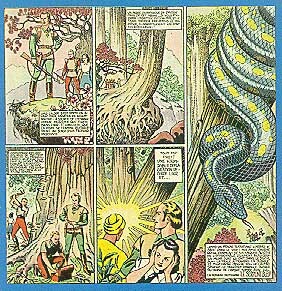 Commercial illustrator, fashion designer and even opera baritone, Edgar Pierre Jacobs (1904-1987) entered the comics field during World War II, when, in 1942, he was asked to complete the adventures of Flash Gordon. 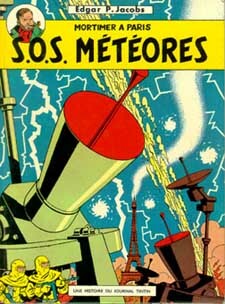 In 1943, his publisher asked him to create a similar series, which he did: Le Rayon U. In 1943, Jacobs joined the Hergé studio and collaborated on some of the Tintin stories, redrawing the backgrounds and costumes of The Blue Lotus and King Ottokar's Sceptre for their revised editions, as well as contributing to The Seven Crystal Balls and The Temple of the Sun. 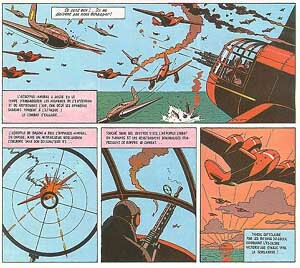 Edgar P. Jacobs, almost as much as Hergé, is responsible for the "clear line" style of Belgian comics. 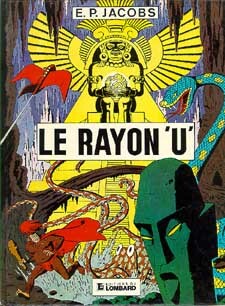 Rayon U, Blake & Mortimer © 2001 Edgar P. Jacobs. All rights reserved.